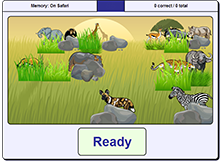 Brained Up features an ever-growing and extensive range of cutting-edge brain training games and activities, covering a wide variety of mental skills and tasks. 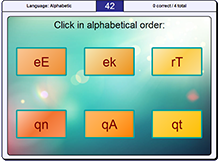 Select the letter sequences in the given order, starting off with a standard alphabetic sort of individual letters but with additional complexity at later stages. The letter sequences vary in length, and at harder skills mix in both lower- and upper-case letters. 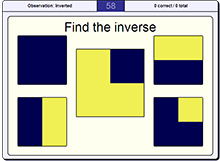 As the game gets trickier, reverse orderings and even backwards-reading are introduced, as well as more sequences per question. 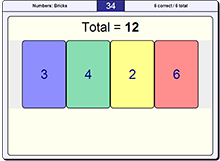 Remove some of the bricks so that the remaining numbers add up to the given total. Bricks slide smoothly to fill the gaps, so answering quickly tests not just good number skills but also your hand-eye coordination. Later challenges for expert players include more bricks, bricks with higher numbers, and other surprises to keep your brain working. 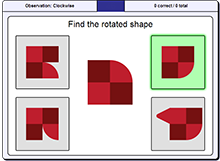 Mentally rotate the given shape and choose the matching image from the option buttons. Speedy manipulation is essential for this game, which is a great test of your visualization skills. Proficiency at this game can help with tasks as diverse as map reading and dancing! Solve the two math calculations as quickly as possible and decide which results in the greater value, or whether they both give the same result. The game varies both the difficulty of the calculations as well as the similarity of the results, ensuring an ever-increasing challenge. Remember the dresses sold on one day, and then remember those sold on the next day too. Now can you recall those from the first day? Next you're shown the sales from a third day. But can you still recall those from the second day? And so it goes on, with more dresses and less visual differences. Study the given groceries, then hide them and see if you can recall which of the new items matches one you just saw. 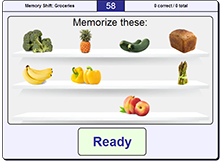 Far more fun than real grocery shopping, with a huge range of over 60 different items, this game is a great test of your visual memory. Imagine inverting all of the tiles in a pattern, then choose the resulting image. With progressively more complex images and subtler changes, plus a range of contrasting color selections, this game will challenge both your visual skills and your concentration. 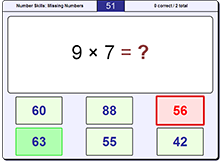 Complete the numeric problems by choosing from the given options. 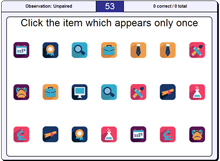 Starting off with easier calculations, the game gently adapts the questions to push your brain to the optimum point where it learns without becoming too frustrated. As you progress, so the number of options to choose from also increases. You're shown a set of names and faces, but can you then identify one of these people from the line-up that follows? As the game progresses, there are more people to remember and more imposters in the line-up. Faces and names also become more similar at harder difficulty levels, and new variations in facial features are gradually unlocked to keep things fresh. A set of numbered and unnumbered tiles appear, then flip over to a blank side once you have memorized them. Now can you select the numbered tiles again in order of increasing value? As the game gets harder so both the quantity of numbered and the quantity of blank tiles increases, and the numbers become less consecutive. Memorize the given pattern as quickly as you can, then hide it and see if you can find the identical image among the options presented. 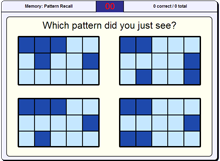 This is a great test of your visual memory and you may be surprised at the complex patterns you will be able to recall! The grids get larger and the patterns get more complex as you progress. 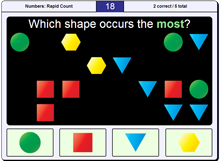 Decide as fast as possible which shape occurs either the most or the least. The game slowly introduces more shapes with less difference in their counts, as well as different types of shape and color, and at hard levels the shapes are less carefully arranged too. This game is a great workout for your observation skills. Safari animals appear in turn from behind grass and rocks, then disappear again when you are ready. Now an imposter appears - can you identify the new animal? 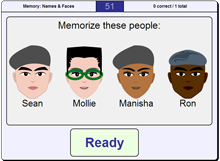 This game tests your working memory as well as your memorization tactics, and at harder levels your ability to visually extrapolate from parts of a concealed image. 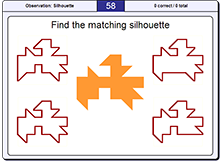 Find the only one of the given outlines that matches the central shape, and do it as fast as possible. This test of your visual skills can be surprisingly challenging, and an enormous variety of potential patterns help ensure the game remains fresh to your brain every time you play. 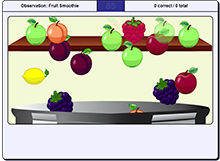 Watch the fruit fall into the blender, keeping track of which item you see the most. This game is an all-round mental workout, practicing the rapid observation of multiple stimuli all at once. 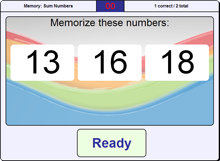 It also works on improving both number skills and your working memory. Sort the tiles into numeric order as fast as you can, and without the option to change your mind! This game is surprisingly challenging when you play at speed, and features hundreds of potential difficulty adaptations to provide a continuing learning experience for your brain. How many words have a color that matches their meaning? 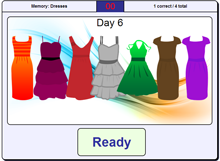 This game is based on the Stroop effect, where a contradictory meaning of a word can significantly increase your reaction time, making it surprisingly tricky. In this modern version, the game gets harder not just by adding words but also uses some psychological tricks to maximize the challenge for your brain! Remember the given numbers, then select which of the listed totals can be made by adding up two of the numbers you just saw. 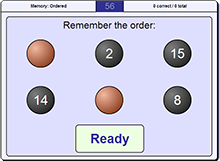 This game is a fantastic exercise for both your memory and number skills, requiring you to use both simultaneously to make progress. On tougher skill levels there are extra and larger numbers, and more of them are included in the total. There are two of every object, except for just one item which remains unpaired. Can you find the single object, and how quickly can you do so? 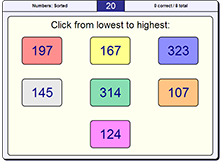 As the game progresses, the number of objects increases and the similarity decreases. This can be a surprisingly tricky task, and is a great test of both your observation and your memory skills. Fit the words back into the gaps in the chain as fast as possible, so that at each step only one letter changes and no letters are rearranged. But there's a twist - you must do this in your head, and answer the question by working out which word must come last in the chain. As the game progresses, chains get longer and progressions get trickier.